Apparently the Japanese version of the software received the update earlier in February (I think) so this release was for the English version of CSP. Unfortunately the feature is so new there is no English video tutorials showing how to use it (and only one Japanese video that I could find). The release notes kind of explain the various features but that's it. The manual doesn't mention anything at all. (At the time of writing this there is an updated English start-up pdf guide here that runs through the basics). Fortunately the basics were not too hard to work out. 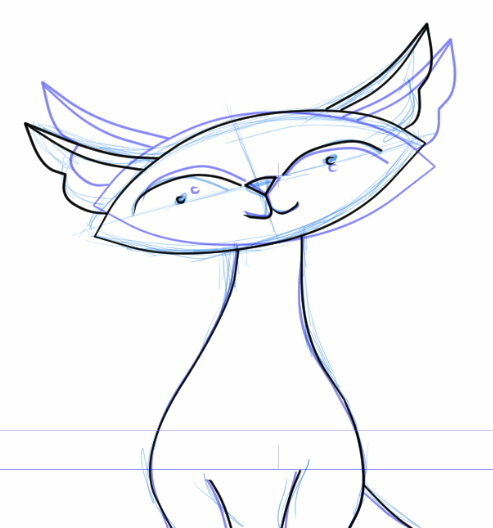 I sat down with CSP over the weekend and managed to produce a one second animation of one of my cats. See the video below. As you can see it's very rough. I really only created it to learn the new tools. I can't tell you how great it is to be able to sketch out by hand the individual cells in my preferred drawing software. For the most part I worked it out. You simply set up an animation folder that holds each cell in the current sequence. You can have multiple animation folders for different parts of the animation. I used one folder for my roughs then created a new folder for my clean-up drawings. I also created a new folder for my color layer. All of this made it easy to turn each stage on and off as needed. The onion skin feature is great. You can see any number of previous and next frames in whatever color you'd like them to be. There's also a lightbox feature that I've yet to work out. Plus, there doesn't seem to be any way to duplicate entire cells beyond using the selection tools and copying and pasting everything you need to a new frame. I'm sure there's a better way, I just haven't found it yet. After you've drawn all your key frames it's easy enough to adjust the timing on the timeline simply by dragging the frame numbers around. You can animate on ones twos etc. as you like. The timeline will display the last key frame in the sequence until you add a new key frame. 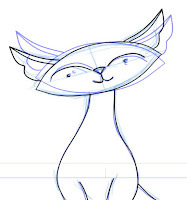 Once you've finished your animation you can export it as an avi video file or animated GIF. There's also options to export all your individual cells too - making CSP a great option for drawing roughs and then exporting to a vector animation tool of your choice. Note that you can create vector animation with CSP but you can't export images in vector format. Finished Animation exported as a GIF. CSP will also let you import video files, which could be useful for roto-scoping, reference or just adding a video element created in other software. As far as I can tell there is no ability to add audio to your animations. This is strictly a tool for creating the visuals. If all this sounds exciting and you're thinking of buying CSP be aware that only the EX version allows animations of unlimited length. PRO and Debut versions limit you to 24 frames (i.e. one second) of animation. I would highly recommend CSP as a great tool for this kind of animation, not too mention all the other illustration tools that makes CSP the must have tool for cartoonists, comic book creators and now animators. It's just better to draw with than any other software I've come across. Check out CSP's full list of useful animation features on their website. Just a suggestion: To duplicate a cell, you can just duplicate the layer in the layer palette and specify this new layer as a cell in the timeline. If you have 'duplicate layer' and 'specify cell' as kyboard shortcuts, it's a fairly quick process. Thanks for the tip. That seems to work really well. Hello David: I've upgraded to the latest version but don't see the Animation category when I open a new file? How do I enable the animation module? Thanks! Oh wait, just realized it installed it as a new app folder. My shortcut was pointing to the old one. Thanks!